Left: Luther fenced in the parent navel orange trees at the Tibbets home to protect them from the theft of valuable buds. Right: Tibbets house on Central Avenue with the parent navel orange trees behind barbed wire. Both Luther and Eliza had three marriages. “By his first wife, Luther had five children. When she died he married her younger sister. On the eve of her third maternity he deserted her … according to one of his daughters.” Luther consulted a doctor in New York City about his eyes, and met the doctor’s wife, a Spiritualist medium named Eliza; the two “tried to get in touch with his departed first wife.” The pair moved to Washington. Her son married Luther’s eldest daughter, and the two men opened a general store in Fredericksburg, Virginia. “Their Union sympathies soon brought ostracism … broke or nearly so, they heard of John North’s colony plans … and left for Riverside.” Each built a modest house on the Government Tract. With his wife Eliza, he was responsible for the local introduction of the navel orange in 1873. Though the claim is often hotly contested, although there seems less controversy about Eliza’s role in fostering the first trees. It was not until the report of the Date Correction Committee in 1933 that all the facts of the introduction of the navel orange were sorted out, and they are still contested. In all likelihood, the Tibbets’ trees were planted in 1874 or 5 and did not produce fruit until 1879. The Bahia orange came to be called the “Riverside” navel orange so planters could distinguish the root stock; it later took the name “Washington” so real estate developers in Redlands, Corona and Bryn Mawr—other communities founded on navel orange culture—wouldn’t hesitate to promote it. Patterson observes, “There was a comic opera aspect, built around the Tibbbetses.” While that seems to be the case, certainly they were the instruments through which the navel orange came to Riverside and through which it prospered. Previously introduced to Florida and Australia, the Bahia orange needed a dry climate to produce the taste that made it remarkable. When Eliza came to Riverside, she lived with her son and his wife. In 1874 Luther and Eliza went to Justice of the Peace, Lyman C. Waite and asked him “to draw up an agreement whereby they might be able to live together” which they did, later that year. The Tibbets’ fortunes “were more down than up, and while they prospered a while from subdividing their land, they both died in poverty.… Having sold half his original claim, Luther” was able to build a comfortable home; he “went bankrupt in 1878, but retained the property…. In 1887 at the height of the boom he subdivided the remaining land and sold some lots. For a time Luther and Eliza rode in a top buggy behind a hired driver. They made a trip to the East.” Unfortunately, as “the boom ended their fortunes waned again.” Eliza developed a number of medical problems and died in July 1898, the same year creditors foreclosed on their property. Luther tried various legal maneuvers, but was evicted the following year. For the remainder of his life he was supported by the kindness of friends. 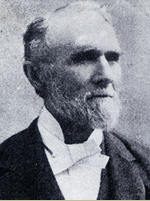 Louis Jacobs bought the Tibbets property and gave one of the original orange trees to the City of Riverside and one to the Riverside Historical Society. “The city transplanted its tree to the present tiny park location on April 23, 1902. Luther died the following July 21, at the age of 80.” The plaque that accompanies that tree acknowledges only Eliza for her “good work” in the introduction of the navel orange. Minnie Tibbets Mills, one of Luther’s daughters from his first marriage, waged a campaign to restore dignity to her father. Published in 1942 in the “Quarterly of the Historical Society of Southern California,” her account challenged the Committee report to set straight the history of the navel orange. The common recollection, and the Committee’s conclusion, was that “Luther paid little attention to the trees, except to sell buds after they proved to be valuable. The common belief was that Eliza rather than Luther was not only responsible for bringing the trees to Riverside but was the one who cared for them or arranged for their care after they were planted.” Mrs. Mills saw to it that a second plaque was erected for her father in 1935 at the site of the original trees. And there was more. The small headstones points to another, darker, story in the Tibbets saga. In the late 1870s colony property owners were at the mercy of the river, canals and flumes—not only for water, but for accessible routes across the county. There was talk of a future bridge, but on April 20, 1878, there was none, and Daisy Summons, 10-year-old granddaughter of Luther and Eliza Tibbets was drowned. Luther Tibbets was a man of positive mind, who acted upon his own judgments in defiance of contrary advice. His judgment often was bad and he suffered from it, but still he retained full self-confidence. That morning Tibbets and his party were in Colton, taking on supplies in a lumber wagon, drawn by four horses. Charles North, one of the founder’s sons, crossed after him in a high wheeled buggy and found the river dangerously deep and rising. Seeing Tibbets, North advised him not to return until the water was lower. Tibbets observed … that ‘Four horses can paddle through a good deal.’ He ventured into the stream soon after noon. Eliza and Daisy were with him on the front seat, Daisy in the middle. On the back seat were two Spiritualist friends…. Midstream, the horses floundered and got off the course. The wagon tipped over …. Two horsemen … saw the accident … rode into the stream and helped the adults ashore. Daisy was nowhere in sight. The horsemen went into the water again, righted the wagon and her body floated to the surface.